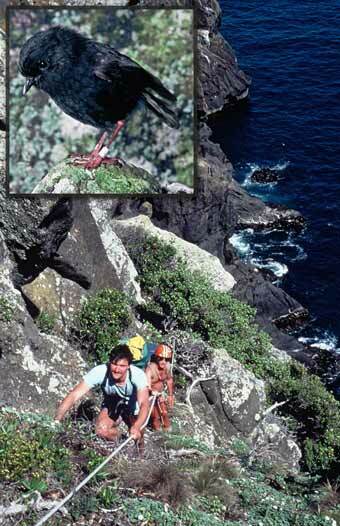 A box holding a pair of black robins is carried down cliffs on Little Mangere Island, one of the Chatham Islands, in 1976. Conservationist Don Merton remembers telling the carrier, ‘You’ve got half the world’s breeding population of black robins on your back, so be careful.’ The birds were taken to nearby Mangere Island, which had better forest. From just five birds in 1979 (and one breeding pair), numbers grew to about 250 in the early 2000s. All the birds alive today are descendants of just one female named Old Blue (inset). In 2005, black robins were classified as ‘nationally critical’.